You know when you go into one of those frozen yogurt bars and get just a little carried away? It all happens so fast. You get really excited because your favourite flavour is back – then the featured flavour catches your eye and that swirl option just looks oh-so-tempting and before you know it, you’ve got a 1/2 pint of mango-crème brûlée-oreo cookie crumble staring back at you. That excitement – that no-holds-barred risk-taking creativity – that’s how you should approach your kitchen every single day. Sure, you need to reign it in just a little (I don’t know how many times I’ve told my boyfriend that I will NOT make a hamburger topped with caramel sauce), but keep in mind that all of your favourite recipes are the result of someone, somewhere saying, “why not?”. I found the best way to get myself into the groove of cooking off the books was to start making tiny variations on recipes I already know by heart. For example, make a simple fettuccine alfredo recipe, but toss in some fresh asparagus, or knead up Alton Brown’s pizza dough, but top it with whatever you have in your fridge instead of making a special trip to the store for someone else’s idea of what should go on your pie. Ice cream is an incredibly easy and fun food to customize – I know it can sound complicated at first, but once you familiarize yourself with my three-step system, you’ll be leaving your ice cream maker out on the counter from now until October! First, you want to make your custard. A custard is basically just a mixture of egg yolks, sugar and cream. To make it, whisk together the yolks and sugar (and sometimes vanilla and salt for flavour). Meanwhile, heat the cream until small bubbles form around the edge. Then you want to very slowly whisk the cream into your yolk mixture – a really handy trick to whisk in the cream without the bowl roaming around your counter is to anchor the bowl in a pot, like I’ve done here. You can also add in any last-minute flavourings for the base ice cream here – for a bit of tartness, I opted for a squirt of lime juice and a hint of zest. Be sure to chill the custard to room temperature before storing it in your fridge to chill completely. Next, make your flavouring. The options are pretty much endless – caramel ripples, raspberry swirls, fudgey trails – think back to the frozen yogurt story and let your inner mixmaster free. For my ice cream, I opted for a simple blueberry sauce. With any fruit sauce, you want to cook it with a little bit of sugar and some lemon juice to really bring out the flavour. This mixture should also be chilled before you add it to your ice cream. Lastly, churn and swirl. Place your pre-chilled ice cream maker bowl into the unit and turn it on. Slowly pour in the cold custard while the machine is running and let it churn for about 45 minutes. Depending on your unit and the temperature in your kitchen, the custard may not reach that ice cream consistency you’re looking for, so you want to transfer it to a shallow container and freeze it for another hour or so. But before you do so, you’ll want to swirl in your flavouring. Here’s a quick video I made that shows how I do it. Now you just need to freeze it until firm! Here’s my recipe below (I adapted it from a basic ice cream recipe from Cuisinart). 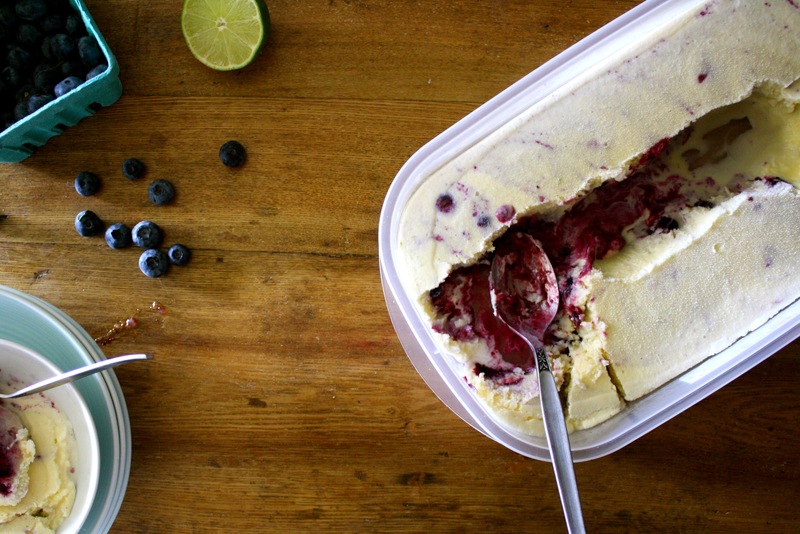 Kissed with tart lime, this custard-style ice cream features a brilliant blue swirl of fresh local blueberries. 1. In a medium saucepan, combine cream and milk. Heat on medium and cook uncovered until edges begin to bubble; do not bring to a boil. 3. Return mixture to pot and heat on low, whisking often, until thick enough to coat the back of a wooden spoon. 4. Let cool to room temperature, then transfer to a large shallow container and refrigerate until cold, 2 to 4 hours, but ideally overnight. 5. Meanwhile, prepare blueberry swirl: In a small saucepan, combine all ingredients and heat on medium. Bring to a boil, reduce heat to a gentle simmer and cook uncovered until berries begin to break down and mixture thickens to a rich sauce. Cool to room temperature, then transfer to a separate bowl and refrigerate until cold, at least 2 hours. 6. Turn on ice cream maker and pour in chilled cream mixture while motor is running. Churn according to manufacturer directions. Return mixture to the large, shallow container. Pour blueberry mixture into centre of mixture and swirl through mixture with a butter knife. Freeze until firm. 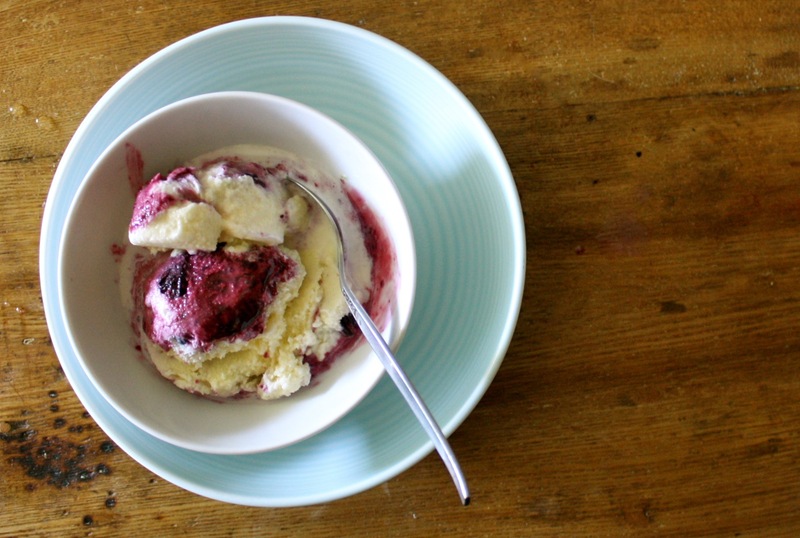 Ice cream will stay good in your freezer for four to five days.